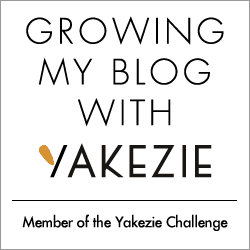 Just thought I'd share the exciting news that I've joined the Yakezie Blog Challenge. I'm still a newbie on the site but wanted you, my readers, to be the first to know. Blogging can be a lonesome journey though, as a self-confessed hermit, I prefer to be alone - alone than lonely in a crowd. I like to scatter my pearls of wisdom far and wide and also gather gems from others. Yakezie is win-win for all and I'm proud to be on the team. Getting rich slowly....inside and out!